I came up with this dinner completely on a whim. I needed to make a dinner quickly with what I had in the fridge and in the freezer. 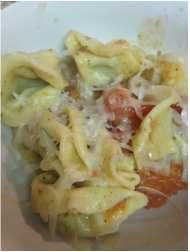 I had some pesto tortellini from Trader Joe's in the freezer, which can be boiled frozen. I also had some pre-cooked shrimp in the freezer that I took out and put in a bowl of warm water to defrost while I was prepping the rest of the ingredients. The sauce was the tough part, I always have onions and garlic on hand, and I had a bottle of white wine. This translated into sauce. This dinner came together from frozen to on the table in only a half hour. 1. Boil a pot of water over medium heat. 2. Melt butter in saucepan over medium heat. Add onions and garlic and cook for 2-3 minutes. 3. Add wine to sauce and bring to a boil. Add seasoning. Cover and let simmer and reduce while preparing the rest of the dish. 4. Start tortellini. Cook according to package directions. Probably about 8 minutes. 5. Add shrimp to boiling water for last 2-3 minutes of pasta cooking time. 6. Stir sauce. If not thick enough, add flour as needed to thicken. 7. Stir in tomatoes to sauce for the last minute to two to warm them through. 8. Drain tortellini and return to pot. Pour sauce of tortellini. Serve topped with Parmesan cheese.